Cold surface temperatures, reflecting Scotian Shelf origins and local tidal mixing, serve as a tracer of the Eastern Maine Coastal Current and its offshore extensions, which appear episodically as cold plumes erupting from the eastern Maine shelf. A cold water plume emanating from the Eastern Maine Coastal Current in May 1994 was investigated using advanced very high resolution radiometer (AVHRR) imagery, shipboard surveys of physical and biochemical properties, and satellite-tracked drifters. Evidence is presented that suggests that some of the plume waters were entrained within the cyclonic circulation over Jordan Basin, while the major portion participated in an anticyclonic eddy at the distal end of the plume. Calculations of the nitrate transported offshore by the plume show that this feature can episodically export significant quantities of nutrients from the Eastern Maine Coastal Current to offshore regions that are generally nutrient depleted during spring-summer. A series of AVHRR images is used to document the seasonal along-shelf progression of the coastal plume separation point. We speculate on potential causes and consequences of plume separation from the coastal current and suggest that this feature may be an important factor influencing the patterns and overall biological productivity of the eastern Gulf of Maine. Pettigrew NR, Townsend DW, Xue HJ, Wallinga JP, Brickley PJ, Hetland RD. 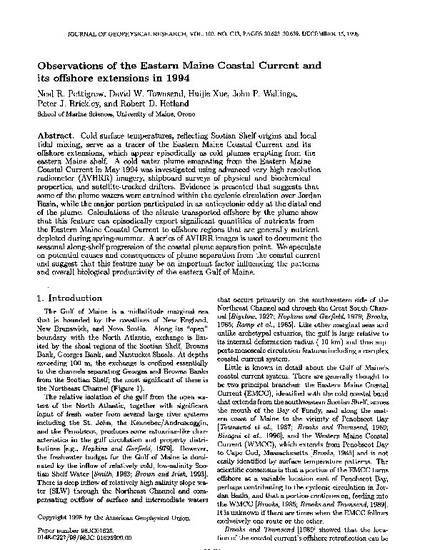 Observations of the Eastern Maine Coastal Current and Its Offshore Extensions in 1994. Journal of Geophysical Research-Oceans. 1998;103: 30623-30639. To view the published open abstract, go to http://dx.doi.org and enter the DOI.